This was the scene earlier at Hwy. 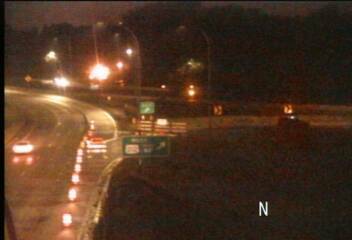 65 at E. Moore Lake Drive in Fridley. The scene was clearing at 8:50 a.m. with a couple squads still taking out the right shoulder. Northbound I-35W sees a thick pocket of traffic around 50th Street. A new hotspot is a mishap on northbound I-35E at W. 7th Street. Be prepard for a five-minute set back. 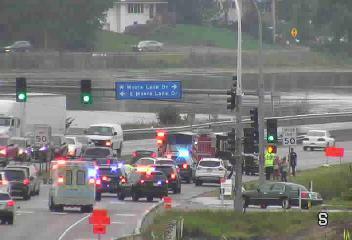 Other crashes are reported on westbound I-494 at Penn Avenue and southbound Hwy. 100 at I-494. In the west metro, slow going in both directions of Hwy. 169 between 36th Avenue N. and Hwy. 7. Same is true on Hwy. 100. A commute alert for Edina drivers. The ramps from northbound Hwy. 169 to westbound Hwy. 212/62 and eastbound Hwy. 62 from Gleason Road are closed for construction.